I posted last week on a line drill focusing on a jab and opposite cross and Pat from Mokuren Dojo came back with Don't just do Tsuki Forever, a great continuation from the previous post. This week I thought I should cover a great drill we introduce at Do-san/7th kyu to defend against straight blast or continuous punching to the face. This move is based off the R spear hand into L mid block arm action introduced in Do-san steps 6&7. In the video you see 7th kyu Jacqui defending against basic punches done by 9th kyu Christian. The video is fairly self explanatory - the blocks come to the outside of Christian's forearms. The deflection is done conservatively in order to deal with the speed of the punches - it allows Jacqui to block repeatedly without getting her nose knocked off. 7th Kyu Adina faces off 6th Kyu Jacob - both hands held in front and as you can see her right hand comes back to block the outside of Jacob's punch. The next shot in the sequence you can see Adina raising her elbow to block Jacob's left punch. The punch is only deflected so much in order to keep the blocking arms held high and in front of the face. Last close up - look at how the back hand protects the face in case the block misses. Also look at how the face is tucked down in the neck. There is some intense concentration involved, folks. Any miss is a near miss, let me tell you ... the heart rate really goes up with the punches come hard and fast. I especially like the guard postion. Having the guard held in front of the face open handed rather as a fist by the side of the jaw offers a lot more protection in my opinion. I've been told before, and I've found it to be true in a lot of cases, that 'A closed fist is a closed mind." It happens in judo - when you get so intensely concentrated on getting and keeping your desired grip, your movement and your judo goes to pot. It happens in aikido - when you get to worrying about how you are holding the guy then you get hammered by the other arm. I have heard about some studies that some cognitive scientists did that showed that you only have to exert about two pounds of force with a fist before your higher cognitive (i.e. math, reasoning) skills in your brain shut down. I know for a fact that a punch need only be held in a fist right before the end. It doesn't increase power to chamber as a fist before punching out. 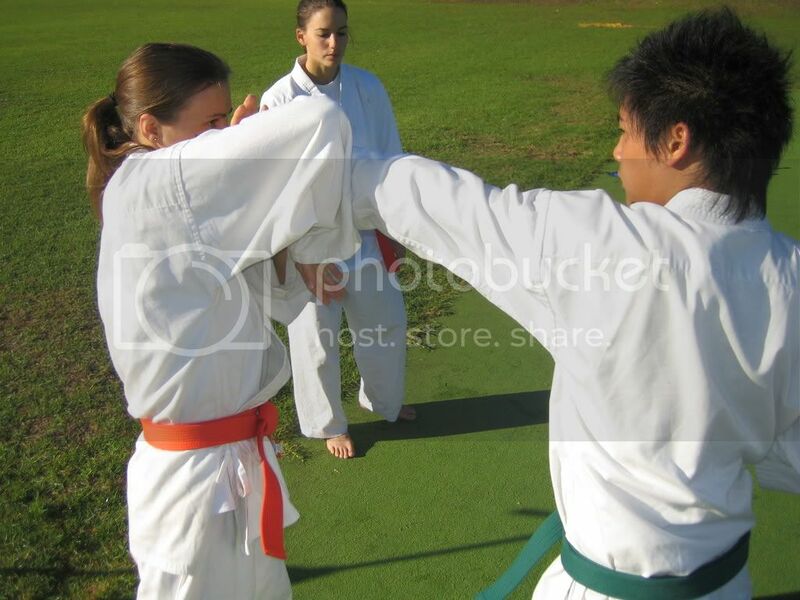 The manner in which hard stylists are drilled with hikite or pull back hand in a fist is to only help reiteration and to enforce that the chambered fist is grabbing on to some part of the opponent's clothing. I don't know about the intelligence being leached out of your brain by a closed fist -- but really, martial artists aren't famous for being brainiacs! I can’t say I’m impressed with this drill. For one the attacker’s punch is fully extended before he even reaches the defender’s face meaning she’ll never get hit even if she does nothing, what’s the point of defending attacks that’ll never connect anyway? With a good defense his fist should pass over your shoulder nearly missing your head, this is clearly not the case here. My second problem with this is that she seems to grab while parrying: this is dangerous since he’ll be able to pull you off balance when he retracts his arm (presumably into another strike), that is if she indeed would be able to grab if he would actually mount some decent attacks: you do not leave your arm dangling after you extended and attacks should be fluid and smooth, not mechanical like in the video. The second hand covering the face is unnecessary (just move your head out of the way and he’ll never be able to hit you even if you mess up your hand-defense) plus it’s entirely defensive to use both hands to protect yourself: even if you manage to defend the first punches the initiative will be his and he’ll keep attacking until he connects sooner or later. Yet to your credit I must say it’s better than most traditional defenses against straight-punches (a rising block is way too slow, as is an inside forearm-block), still if you want optimal defense against fast, crisp straight punches learn some boxing. Parrying combined with a slip is the best guarantee you won’t get hit, especially if you move diagonally (a half step is enough) to your opponent’s dead-side. This provides optimal protection (your head is out of the way of the punch, the parry acts as an extra safety and you’re closing in so he can’t punch anymore) plus you’ll be in a great position to counter. Staying put (meaning in front of the opponent) while defending is not a great idea since he still has 3 other weapons to attack you with. Against a really good opponent I wouldn’t parry on the forearm since he’ll either use your energy to transform his punch into a swing to your face or he’ll simply collapse his arm, hitting you with an elbow-strike. Another classic strategy would be to grab his arm and pull while hitting with the other fist, thus creating a trap. I seriously doubt a lot of people (let alone those you’ll likely to face in a self-defense situation) are that good but it pays to be prepared. That statement Patrick made is bull: a lot of martial-arts (indeed most of them) make use of the closed fist to deliver attacks or counterstrikes (be it forefist, hammerfist or backfist), do you really want to claim they’re idiotic or ‘close-minded’ (whatever he means by that)? Fights are not won by aggression or mere technique (be it open or closed hand, throw or strike): watch any pro-boxing match and you’ll know boxing is a thinking man’s game (anticipating the opponent, deceiving him and recognizing openings and weaknesses) and closed-fists are their primary and indeed only weapon. 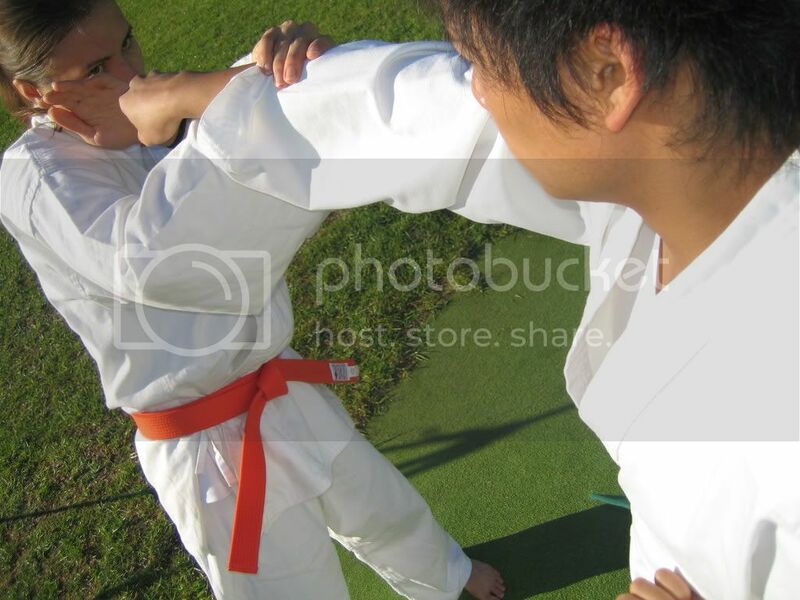 It’s not because you practice grappling-styles like judo and aikido and probably know very little about striking arts (which are way more effective and practical for actual fighting than either art you practice) that you get to make gross generalizations or meaningless statements which can construed as insulting to a number of people. A witty saying proves nothing and his isn’t even that witty. Just in case it does, I’ve got another witty saying for you: minds are like parachutes, they only function when they’re open. Yours clearly isn’t. Besides: any good fighter stays relaxed until the split-second he actually hits the opponent, then and only then does he contract his muscles and clenches his fists to transfer the maximum amount of energy into the opponent. Only amateurs and beginners fight with their fists fully closed or tensed up. About your so called evidence: it’s not clenched fists that make you revert to an animal mindset (the reptilian brain) but fear, adrenaline and aggression. You’ve clearly mistaken cause for effect here. In any case you don’t need mathematical thinking or indeed conscious reasoning in a fight: everything happens so fast and you react instinctively, relying on intuition and the information stored in your body by countless hours of practice. If you think while fighting you’re dead (it breaks concentration on the moment and the opponent), thinking slows down reaction time and MA are all about eliminating conscious thought thus developing a sixth sense to danger and the ability to read your opponent’s body-language. It’s typical for beginners to have to think about every little detail (how do I stand? How do I move? How much do I have to turn my wrist?) while performing a technique, an evolved practitioner just feels and acts. This is what is meant by the Buddhist saying ‘munen mushin’ or ‘no thoughts, no ideas’: an empty mind full of possibility (excluding nothing) with no sense of self or abstract thought. Those who hold the opinion fighting is some sort of chess-game or intellectual exercise are sorely mistaken and obviously have never been in a real fight. Martial-artists maybe engineers, doctors, philosophers, writers or mathematicians but if they think as intellectuals while training (let alone fighting) they’re not true martial-artists and certainly not good ones. "Fights are not won by aggression or mere technique (be it open or closed hand, throw or strike): watch any pro-boxing match and you’ll know boxing is a thinking man’s game (anticipating the opponent, deceiving him and recognizing openings and weaknesses) and closed-fists are their primary and indeed only weapon." "Those who hold the opinion fighting is some sort of chess-game or intellectual exercise are sorely mistaken and obviously have never been in a real fight." This seems more like a whinge or just plain self glorification, but definitely not a CONSTRUCTIVE criticism. - "attacker’s punch is fully extended before he even reaches the defender’s face meaning she’ll never get hit even if she does nothing" Read the post! 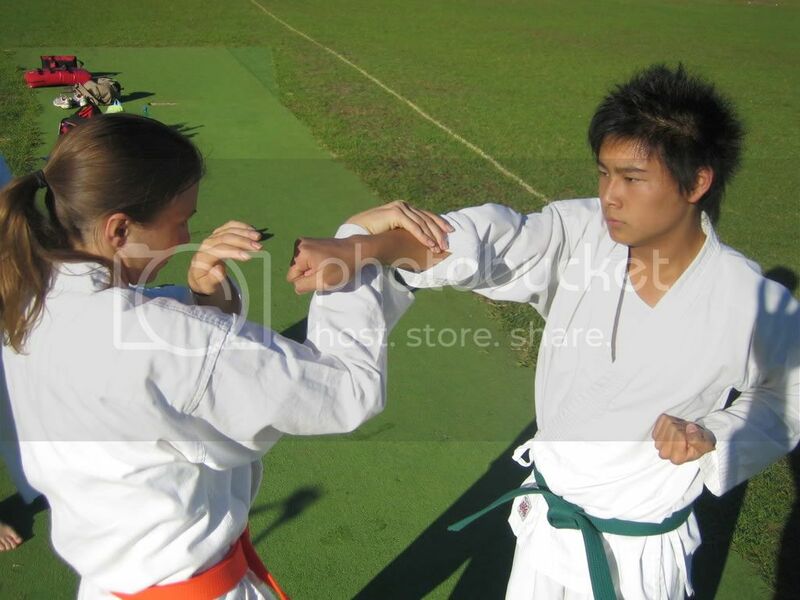 This is a 9th kyu (incidentally myself after having practiced TKD for about a month) going against a 7th kyu. These are beginners practicing a new technique, so don't expect it to be perfect. - "you do not leave your arm dangling after you extended and attacks should be fluid and smooth" Again: beginners at work and we are trying to PRACTICE a new technique here, not demonstrate it for people to afraid to put their name behind a very provocative comment. - "Martial-artists maybe engineers, doctors, philosophers, writers or mathematicians but if they think as intellectuals while training (let alone fighting) they’re not true martial-artists and certainly not good ones." I would say that is one of the most stupid thing I've ever heard. When you train and fight, you should be thinking about everything you do! Perhaps less about what technique to apply or how to defend against an attack, but about strategy, environment, and your opponent. Just to quote the author: "boxing is a thinking man’s game"
Hello, this is my first post on this site. I know it's only a drill but I always like to mention to my students ( I'm a junior instructor with 1 years experience so I'm no expert but.. ) the have one hand up to guard your face and one lower to guard your body ( as a general rule ) so with the technique shown both hands are up high, nothing is protecting the body. If I were doing something like this ( disclaimer as above in brackets ) I would like to see my students move to the side when they execute the elbow block to at least minimize their bodies exposure a bit.